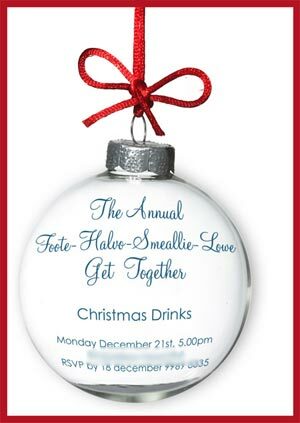 Christmas ornaments are great designs to use on your Christmas party invitations. It is only natural to associate a Hanging decoration with Christmas and so it instantly sets the tone for you planned celebration. You can find rubber stamps with bauble impressions in craft stores and you can purchase cheap paper cut out embellishments on auction sites like ebay.com. This is a digital invitation that I made for a client this year. It is a clear glass Christmas bauble tied on to the end of a bright red piece of ribbon (or cording) It is backed by a plain white background. I have filled it with the Information for the Family get-together. The text has been warped to give the effect that it has been printed onto the surface of the ornament. If you would this invitation then you can order it as a printable christmas invitation. We can change the wording to suit your Work party, Family get together or End of year break up.